It has been many months in the planning, but brothers George, Dennis, Jacob Marc and Fabian finally embarked on our nine-day visit to Italy and the homes of the Vitorchiano, Civitella, Siloé and Bosé communities. And much is to be said. Significantly, the Trappist community of seventy-five sisters at Vitorchiano, 80 km north of Rome, wishes to establish a relationship with us. They are an inspiring group of women, whose founder, the beatified Maria Gabriella felt called by God to offer her life for Christian unity. Blessed Gabriella reposes in a chapel close to the monastery’s guest accommodation, and we were highly privileged to pray alongside her and be given a relic symbolising our mutual commitment to prayer for unity and ongoing relationship. In addition, we were invited to see the enclosed life of the sisters in this place as they opened to us the 100-acre grounds, and afterwards to sing somewhat off-the-cuff excerpts of English plainchant and hymnody to some rather nonplussed faces in choir! Thankfully, George CR saved much bacon with his skills in translation – a grace which was afforded us many times throughout the trip! Next, we were warmly welcomed by the effective partnership of the Civitella family, which comprises Benedictine nuns and sisters of the Bosé community who have merged to revive the monastic presence in that locale. Here, they sing the Bosé office and plainchant in Latin. We were told how, at first, this required daily choir practices to allow each party to learn the other’s music – A commitment which has clearly borne fruit in their worship. We also learnt something of how guests and larger groups are accommodated alongside the community’s daily life and practice, which we felt was timely given our own community’s recent discussions on this subject. Being shoehorned into a rented Fiat Panda for several hours of our time abroad, we were often able to think together about CR’s future, ideas for hospitality, common life and particularly the necessity for our own enclosure that new monastic buildings would offer. 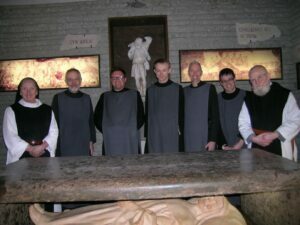 As such, we were much impressed by the spirit of the brothers at Siloé monastery in the Italian Maremma, Tuscany. Several of its founding brothers had had to leave a bigger monastery where their emphasis on more open personal relating was not acceptable. Reading of this in the local press, a local woman unknown to the men freely offered them her land for building. The rest is history! One now encounters a modern purpose-built monastery, whose small church is a converted cowshed, and whose several cats roam blissfully, spying out mice in the mountainous Tuscan countryside and basking in its prevailing sunshine. All the buildings are eco-friendly because the brothers feel strongly that their life should exercise all possible concern for the environment. Water is heated by solar grills installed to the windows and communal spaces are designed to give maximum light and capacity. Every space functions for eating, study, talk and silence. The monks here are known because, “they work” harvesting olives daily in the plenteous groves nearby. They fed us superbly, and we stayed in highly modern cells overlooking the mountains. Bosé was our last and longest-journeying port of call. This community is known for its distinctively international feel and ecumenical atmosphere. I don’t think we had appreciated just how industrious is their work, however! Members set out each day following Mattins and breakfast to begin work in the publishing-house or prodigious gardens, the marvellous jam-making kitchen or icon-painting workshop. Novices of Bosé serve time in every department before they may develop and stay with a particular aptitude for their subsequent life in community. Here again was the now familiar sense of Christian kinship and affection we had come to know in a country where monasticism remains so well embodied as a way of life. We enjoyed further excellent hospitality, as brothers of the community took turns to eat with us. These exchanges not only provide novel encounters for guests every mealtime, but also fulfil a due sense of enclosure for the Bosé members which safeguards their common life. Whilst a couple of us reflected that the worship here is perhaps more exuberant than contemplative, we were in total accord that a good zeal lay at the heart of the community’s life and witness, and indeed was something that characterised the tenor of our visit in every place. For us all, the ‘Italian Job’ has served to enrich our lives as brothers and give deeper insights into the vocation by which God is drawing us to Himself.